There is one condor I’ve gotten to know well over my time as a collaborator with the recovery program. The story of his life encapsulates the hopeful advances and the difficult challenges the species has experienced as a whole. California condor 401 hatched on April 13th 2006 at the Peregrine Fund’s World Center for Birds of Prey in Boise Idaho. As opposed to being raised by zoo keepers wearing condor puppets (i.e., “puppet-reared”), 401 was reared by his mother, condor 56 “Kareya” and father, condor 71 “Tapu” and released to the wild when he was about a year old to fly over the hills of central California and help his species recover from near extinction. I first encountered 401 by way of his blood sample that was collected during routine health monitoring in the spring of 2009 and sent to my lab to be archived for future analysis of lead. Lead poisoning is the number one threat preventing California condor recovery in the wild and my research includes measuring lead isotopes in condor blood samples to identify sources and effects of lead exposure. Condor 401’s blood sample came to my special attention ~ six months later because a radiograph taken of him when he was admitted to the Los Angeles Zoo for treatment of lead poisoning showed he had been shot. His wounds had healed but he had four birdshot pellets embedded in his soft tissue and curiously, he was the third condor that had been found to have been shot within six months (to read about this case see http://www.fws.gov/cno/es/calcondor/PDF_files/2014-9-Finkelstein-Enviromental-Research.pdf). Condor 401 survived his lead poisoning treatment and was released back to the central California countryside. Less than a year later, in June 2010, condor 401 was back at the Los Angeles Zoo being treated for one of the highest blood leads we had seen up to that point – ~560 µg/dL! (Unfortunately in the past few years we have seen several other condors with equivalently high and lethal blood lead levels). 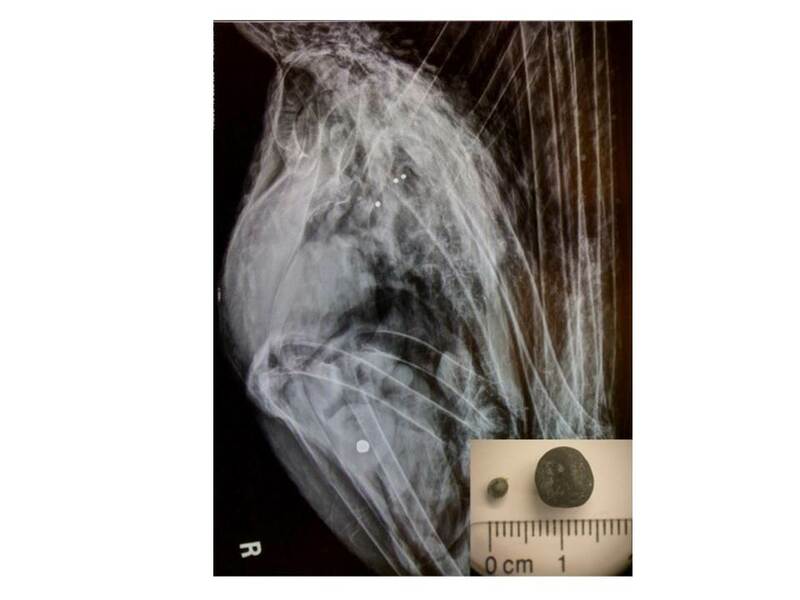 Another radiograph showed that condor 401 had eaten a lead buckshot. 401 was fed rabbit fur to get him to expel the lead item without surgery. Luckily the rabbit fur worked and 401 regurgitated the buckshot! After a few months of intensive treatment by his amazing and talented medical staff, condor 401 recovered and was released again to fly free above the hills of central California. Radiograph of condor 401 taken 21 June 2010 shows three radio-opaque objects embedded in the wing (assumed to be birdshot) and one larger radio-opaque object in digestive tract, later identified as lead buckshot after regurgitation and analysis. Insert panel, lower right: comparison of one of the surgically removed birdshot with the regurgitated buckshot pellets. Figure adapted from Finkelstein et al. (2014). But 401 was not going to be free for long – over the course of his short life in the wild he was treated for lead poisoning at least five times with the last and fatal poisoning event ending his life on June 15th 2014. Condor 401 was only eight years old when he died – just a teenager and well below his ‘normal’ lifespan of ~ about 50 years of age. Importantly, in terms of his species’ future survival, he would also never have the chance to reproduce. I wish I could say that 401’s case was unique, but sadly it is not. Approximately half the condors free-flying in California have been treated for lead poisoning at least once, with many birds being treated more than once. 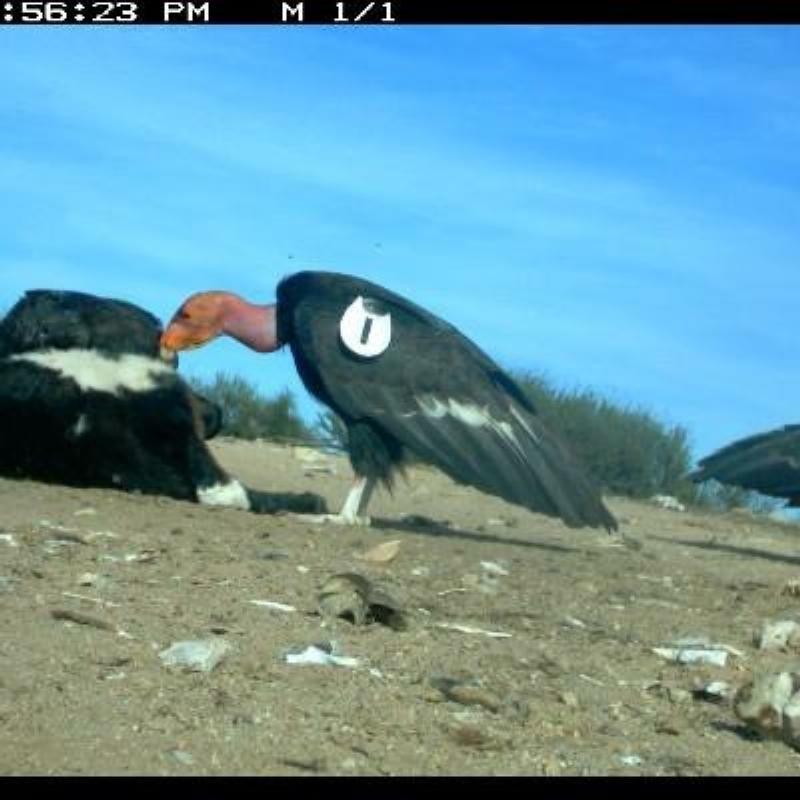 Lead poisoning is the number one cause of mortality for free-flying juvenile and adult condors and our research has shown that condors are primarily lead poisoned by eating animals that have been shot with lead-based ammunition. With so many alternatives to lead ammunition available we are hopeful that one day a condor (or any scavenger) can eat their dinner without risk of being poisoned by lead. May 401’s suffering and death be a reminder to us all about the health risks from lead ammunition (for more information see https://escholarship.org/uc/item/6dq3h64x). For more information on hunting with non-lead ammunition please see http://huntingwithnonlead.org/.